IBPS PO Result 2019 - Institute of Banking Personnel Selection (IBPS) will announce the result of IBPS PO 2019 in October/November. The IBPS PO result 2019 will be announced in three phases - prelims, mains and interview. Candidates will be able to check the result of IBPS PO 2019 in online mode. To check IBPS PO result, candidates must use their login credentials. All those candidates who qualify in the prelims exam will have to appear for the mains exam of IBPS PO 2019 while those who qualify the mains will have to appear for the interview round. Candidates who qualify in interview and stand high on merit will be considered for the final recruitment. The authority will also release the cut off of IBPS Clerk few days after the announcement of result. Scorecard of IBPS PO 2019 will also be released wherein candidates will be able to know the marks scored by them after the process of normalisation. 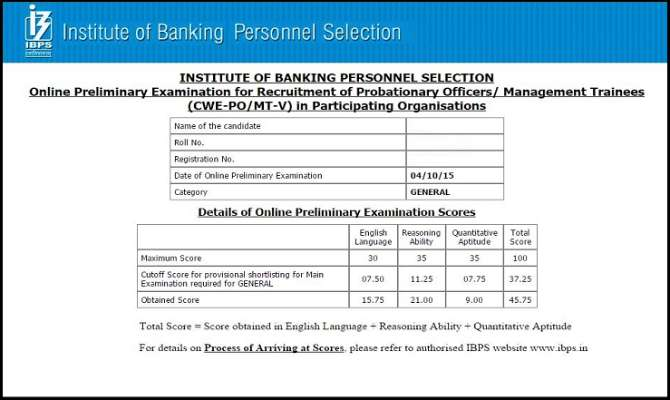 IBPS PO exam is conducted to select the candidates in the Probationary Officer Cadre at various Banks under IBPS. For this, the conducting conducts the test in three phases - prelims, mains, and Interview. The table below contains the important dates related to the IBPS PO 2019 exam and result. How to check IBPS PO Result 2019? The link will redirect you to the result login window. Enter login credentials – registration/roll number and passwords/date of birth. The screen will then display IBPS PO result 2019. Download the result and save it for future references. The preliminary exam result of IBPS PO will be announced in October/November 2019. IBPS PO result 2019 for the preliminary exam will be released to shortlist candidates for the mains exam. All those candidates who score the minimum cut off marks determined by the exam authority as per their category will qualify the exam. Selected candidates from the prelims exam will have to appear for the mains exam. The mains exam result of IBPS PO 2019 will be announced in the third week of December 2019. IBPS PO result 2019 for the mains exam will be announced for shortlisting the candidates for the Interview round. All those candidates who will score the minimum cut off marks determined by the examination authority will be considered qualified for the interview round. The final result of IBPS PO will be announced after the interview is held. Candidates who will qualify in the Interview round and score the final cut off score will be considered qualified. The final result will be prepared taking the marks of both mains exam and interview into consideration. The total score of mains exam will be calculated by using the below-mentioned formula. Marks obtained in Reasoning out of 50+English Language out of 40 + Quantitative Aptitude out of 50 + General Awareness (with special reference to Banking) out of 40 + Computer Knowledge out of 20. The exam of IBPS PO 2019 will be conducted in different shifts and dates. For each shift, candidates are provided different set of online question paper. Thus in order to equalize the difficulty level of each question paper set an equi-percentile method is used to normalize the total marks scored by the candidates.